Description: When Pastor Mark Siegler takes his youth group on a midsummer vacation to San Antonio, he anticipates teaching them about honor and sacrifice at the Alamo. But arrival at the historic landmark brings cutting disillusionment. A troubled teen is determined to make things difficult - and spread his embitterment to the rest of the group. Mark has two choices: give up or try again. Midst his own discouragement, he decides to give them the story behind the legendary Alamo. And his perseverance results in the unforgettable. The sweeping events of the Alamo comes to life through the eyes of an 1800's wheelwright named Silas Edwards. As his tale unfolds, his decision becomes a difficult one. Is defending the Alamo so important? Or are the principles behind opposing General Santa Anna worth sacrificing everything for? Join Private Silas Edwards, David Crockett, William Travis, and Mark's youth group to discover the gripping events behind America's battle cry: "Remember the Alamo!" I love being a Texan. The heritage I have may not stretch back to the revolution, but it still filled with men and women of honor, courage, and faith. Because of this, I approach historical books set in Texas with much trepidation. Most books about Texas do not get Texas at all. They end up either being corny, curd, or just plain ridiculous. This book was not like this. This story started out in modern times, following a youth pastor and some of the boys on a trip to San Antonio. He tries to share with them the meaning of history and how important their faith really is. 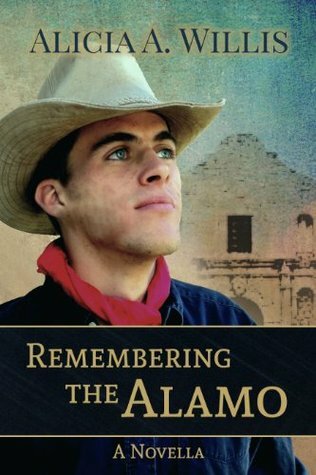 To that end, tells them the story of a young man who fights and the Alamo. I had two and only two things I didn’t like about this story. The first is very minor: The descriptions of Texas seemed very typical of how Hollywood depicts it. However, if you haven’t spent much time in Texas, I can see how that could happen. The second was a little bigger. At the beginning of the book, there was some pretty heavy handed stuff about why Christians should be handing out tracts. I strongly disagree with this point of view, and because it was such a big issue in the book, it detracted some from my enjoyment of the first part. With that said, I loved the rest of the story. One thing that Alicia Willis can never be accused of is doing a sloppy job of research. It is obvious that Willis did her research and did it well. She didn’t rely on movies or other fictional accounts, but tracked down a lot of facts. Even though I have studied a lot about Texas history and the Alamo, I even learned some things. Silas was a godly young man yet very real. He has fears, doubts, desires were all normal, yet he stayed true to his faith and his principles despite everything. He is the kind of book character that young men can look up too and admire. Even though this was only a novella, the historical characters were well written. I now feel I have a better idea of what the men who defended the Alamo were like. Willis did an amazing job bringing the historical characters to life. Overall, I highly recommend this story for those who love history, want to learn more about the Alamo, and like well written tales.